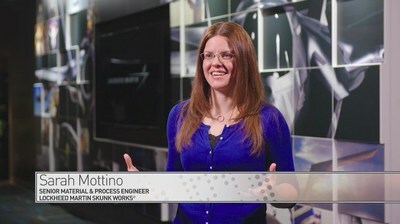 PALMDALE, Calif., Dec. 4, 2018 /PRNewswire/ -- High-school students took a virtual field trip today to Lockheed Martin Skunk Works where they learned about five advanced technology developments being pioneered by the Lockheed Martin engineers and scientists, or "skunks," who work there. The virtual learning experience was designed to introduce students to the exciting work a career in science, technology, engineering and math (STEM) can offer. "STEM education is critical to America's national security and economy – without the right technical talent, we risk losing our competitive advantage," said Jeff Babione, vice president and general manager of Skunk Works. "Technology companies like Lockheed Martin play an important role in helping to inspire and encourage the next generation of technical talent. With our Generation Beyond program, we're challenging high school students to think differently, take risks, innovate and collaborate – skills that are necessary to succeed in a fast-moving, global high-tech economy." The virtual field trip is part of Generation Beyond, Lockheed Martin's free digital STEM education program used in thousands of U.S. classrooms. Launched in 2016 in partnership with Discovery Education, a global leader in standards-based digital content for K-12 classrooms, Generation Beyond puts students in the shoes of scientists and engineers to tackle real-world technology challenges and demonstrate the exciting work that a STEM education and career can offer.